The Tiger Woods PGA Tour Gamepack for Titan One ensures every swing has a full spin and the MOD Perfect Swing disables the X-axis entirely, giving to you a perfectly straight shot every time. 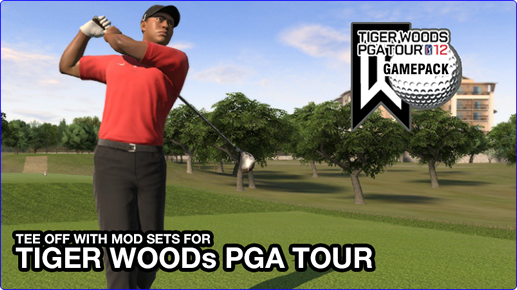 The Tiger Woods PGA Tour Gamepack has two distinct MODS: Perfect Swing and Full Spin. Player LED 1: No MODS is being applied, controller in regular mode. Player LED 4: Perfect Swing and Full Spin MODS activated. Important: Always keep the SELECT (or BACK) button pressed while in Menu mode. To exit the menu mode, release the SELECT (or BACK) button. Player LED 4 will blink the number of current Class. Player LED 3 will blink the number of active MOD for current Class. Dualshock 3 Users: Some Bluetooth dongle are not compatible with Titan One Gamepack LED blinking, causing all LEDs be off or have inconsistent blinking. The solution is try another Bluetooth dongle or use the USB cable to configure the Gamepack. Configure which analog thumb stick is being used for swings. The left thumb stick is being used for swigs. The right thumb stick is being used for swigs.